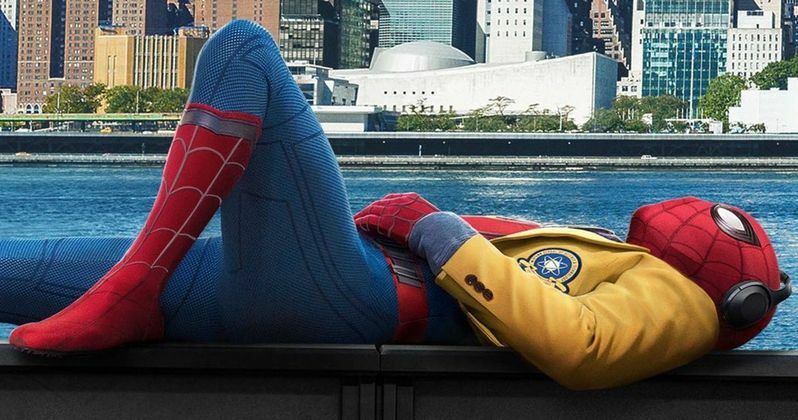 Back in December, Sony set a summer 2019 release date for Spider-Man 2, showing enough confidence in the Homecoming reboot by confirming its sequel months before it even opens in theaters. This didn't exactly come as a surprise, though, since there had been rumors that Marvel and Sony are developing a full Spider-Man trilogy with Tom Holland as Peter Parker. While that third movie has still not been officially confirmed by the studios, Tom Holland let it slip in a recent interview that it will happen. Here's what the actor had to say, when asked about the narrative arc between Spider-Man: Homecoming and other upcoming Spider-Man movies. "There is still a lot of room for Peter Parker, and Spider-Man especially, to grow, in the next two movies. He's definitely not the finished article by the end of Spider-Man: Homecoming, and I really look forward to exploring the different ways he can grow up and go through puberty, I guess. Yeah, it's going to be an exciting couple of movies. Yeah, there will be Spider-Man 2 and 3." The actor made this revelation during an interview with the French publication AlloCine, during a Facebook Live video interview stream. When one of the interviewers mentions that this was the first we've officially heard about a Spider-Man trilogy, the actor responded by saying, "Now, you know, sorry, Marvel, oops!" There has been a long tradition of Marvel actors hinting about "Marvel spies" being ready to take them out if any big secrets are revealed, which the actor continued by pretending to be shot by a blow dart. While this may be the first we've heard about a trilogy from Tom Holland, one of the earliest rumors about Spider-Man: Homecoming is that it starts a trilogy entirely set within Peter Parker's high school years. Although they are also ditching the Spider-Man origin story about the radioactive spider. Instead, when we first met Spidey in Captain America: Civil War, he already has his powers, which he is hiding from his Aunt May (Marisa Tomei) and everyone else he knows. It was later confirmed that Tom Holland's Peter Parker is a sophomore in high school, which backs up the theory that the trilogy will showcase almost his entire time in high school. This is a much different approach than Sony has taken, with both the 2002 Spider-Man and 2012 reboot The Amazing Spider-Man opening with Peter Parker at the end of his high school days. This movie will also steer clear of Spidey's traditional comic book love interests such as Mary Jane Watson and Gwen Stacy, with Liz Allan (Laura Harrier) portraying Peter's unrequited love interest. This movie also features a much different Flash Thompson (Tony Revolori) than we've seen in the past, who was previously portrayed as a blonde-haired jock by Joe Manganiello and Chris Zylka in previous incarnations. With this trilogy completely set in high school, this contentious relationship will certainly be portrayed much differently with Tony Revolori, although we still haven't seen how this will play out quite yet. While we wait for more on this Spider-Man: Homecoming trilogy, take a look at the video interview with Tom Holland below, with the Spider-Man trilogy talk coming at the 8-minute mark.